There are three levels below the street at 19th Street Oakland Station. The first level is the concourse. The second level is the Upper Level (UL) platform. The third level is the Lower Level (LL) platform. The street elevator is located at 1750 Broadway between 17th Street and 19th Street. Street elevator will take you to the concourse level outside the paid area. Press “C” for concourse level. On the concourse level, travel approximately 90 feet to your left to reach the platform elevator outside the paid area. The train platform elevator buttons are labeled "C" for Concourse, Upper Level (UL) platform for the Pittsburg/Bay Point, Richmond bound trains and for Lower Level (LL) platform for the Warm Springs/South Fremont, San Francisco bound trains. 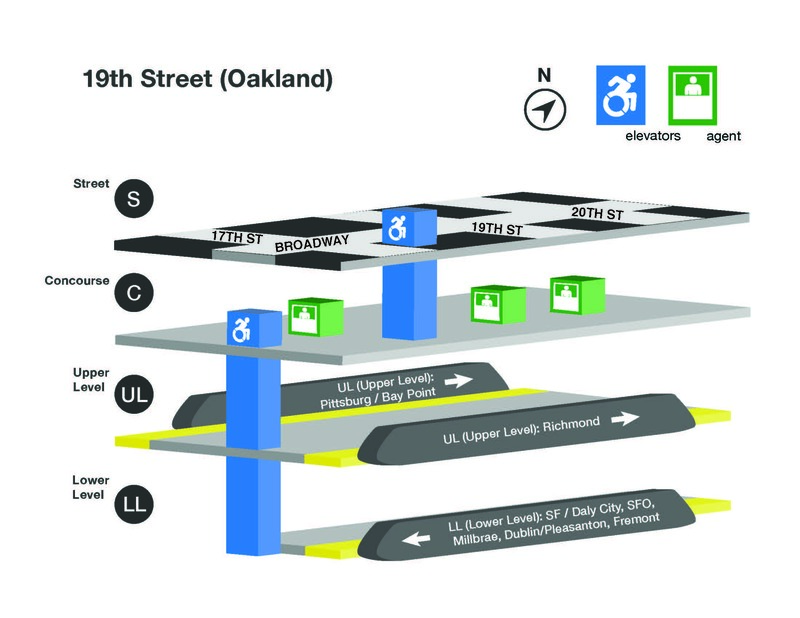 The train platforms at 19th Street Oakland Station are located two and three levels below the street. Two separate elevators are needed to get from the train platform to the street. Exiting from Richmond bound trains or Pittsburg/Bay Point bound trains you will be on the Upper Level (UL) train platform. The elevator will be towards the rear of the train at the far end of the platform. Press “C” for concourse level. Exiting from Warm Springs/South Fremont or San Francisco bound trains you will be on the Lower Level (LL) train platform. The elevator will be towards the front of the train at the far end of the platform. Press “C” for concourse level. On the concourse level, exit the train platform elevator, travel approximately 90 feet your right outside the paid area. Press “S” for street level. When exiting the street elevator, you will be at 1750 Broadway between 17th Street and 19th Street.